No, nothing wrong. Sometimes you make statements that call my attention because it looks like you have priviledge information. That´s all. My superpowers ends on being moderator of this community. DScore is calculated once per day while rating every 4 hours. The recalculation took some time so it was better to wait the next day. 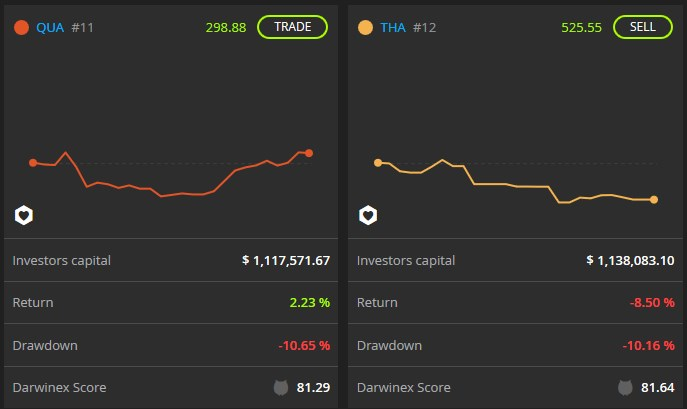 Can anybody explain why THA still has a D-Score above 81 while burning money since more than 3 months? Thats what i recently said... only way to avaid Dscore drop during a DD is to outperform the monkeys by far first, then you have a big breathing room... till performance starts to drop below 9.x ... if this is fair...? i dont know. Why Capacity has a low weight in DScore? Why theoretical Capacity of THA is 1.3MM and his divergence is stil -2% at 1.1MM ? Maybe this will be the work to do for DScore 2019 edition. "Can anybody explain why THA still has a D-Score above 81 while burning money since more than 3 months?" Divergence and capacity attribute is a follow up problem on this and some other Darwins. So I really wonder why a Darwin with 8.5 % losses and more than 10 % DD must have a D-Score > 81. I think D-Score is really missing some dynamic and as you see on the chart: the nearly 17 % DD are freshly made, not historical in these 6 months. Because they trade news with very low liquidity and the capacity algo does not know or regard that. The original question was already answered by @easyFX . Investors tend to consider the behavior of their recent investments, DScore is calculated on a significant part of the trackrecord, 12 DPeriods, not 3 months. I am doing the same kind of studies. Investors are redistributing on a wider number of darwins instead of crowding the same 3 like in the past. There are a lot of seats on many good darwins, a good way to prevent divergence. If you add a hypothetical sum of 5 % divergence of an investor account since January 15th in 4 months to the 17 % DD since that date, that is not significant? So that a D-Score deduction of about only 4.5 points since that date should make investors more confident to the new D-Score formula as a reward for „only“ 22 % DD? Suppose every investor of THA sells the darwin today, what would happen, do you give back 5 points of DScore? DScore rates the quality of a strategy, not the actual condition of the following capital. DScore doesn't depend on the behaviour of investors. You’re right, that D-Score is and should be independent from divergence. But D-Score cannot be a guideline for investors if it protects (migrated) Veterans of trading for 6 months or more while investors are losing a significant amount of money. Hoping and believing is better used in a church than in investing or trading. D-Score should be cut significantly if max. DD is extended significantly after years of history like here. I would expect a cut on D-Score of at least 10 points in this case, it would leave about 75 points on a Darwin with new max. DD where the end of DD is not visible on the chart. This guideline is Under The Radar filter. The filter is a complete recipe while DScore is just an ingredient. This would require a reformulation of the Performance IA , everything could be improved but I would be very careful because IMO it is one of the best algos of Darwinex. DScore rates a trackrecord, not the degree of satisfaction of investors. Yes, and the trackrecord of a 6 months looser cannot be a recommendation with a score in the top 20. That’s why it should be thought about a redesign. I‘m not talking about the Rolling Stines and Satisfaction, i‘m Talking about investors losing money. Talking about investors losing money. I understand but here we are talking about DScore, if you want we can make a long discussion on the reason why investors are losing money on my or your investor topic. Yes, and the trackrecord of a 6 months looser cannot be a recommendation with a score in the top 20. 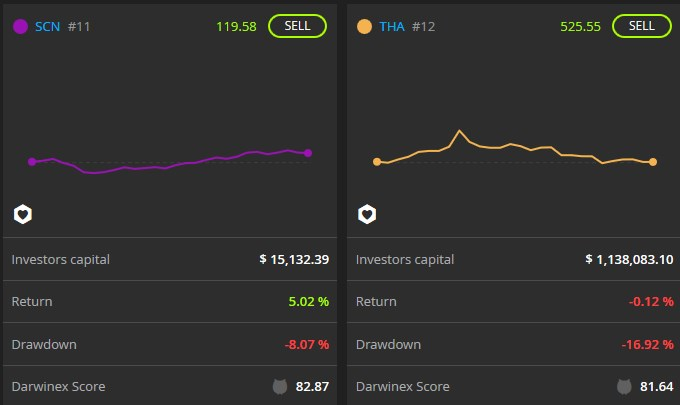 Investors of THA since 12 DPeriods have made a lot of money, as proven by more than 120k of performance fees . That is the reason it is always better to wait at least 6 months after a migration. Also equity is a good indicator, if you don't trust your strategy or the broker why should I trust your darwin? Patience is the key, also investing darwins. As you always argue, there are no smart investors after migration. The ATH was made exactly 1 year after migration. Otherwise it cannot be read as a quality sign. The results of the „under the radar“ filter are documented in the under the radar portfolio here and we will see what’s coming out end of this year. Usually DScore is very sensitive to DD, -10% and you tipically lose 10 points. THA belongs of the 1% Holy Grails that stacked a massive past return. There is much more margin of improvement for investors expectations than for DScore.